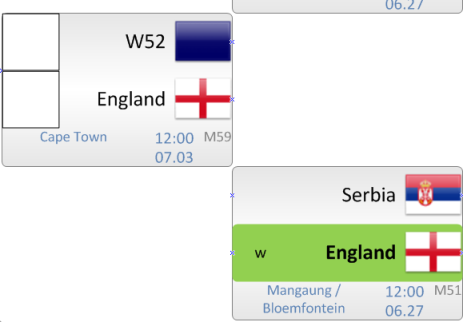 The world’s biggest sporting event has just started and 32 national teams have descended upon South Africa to fight it out! 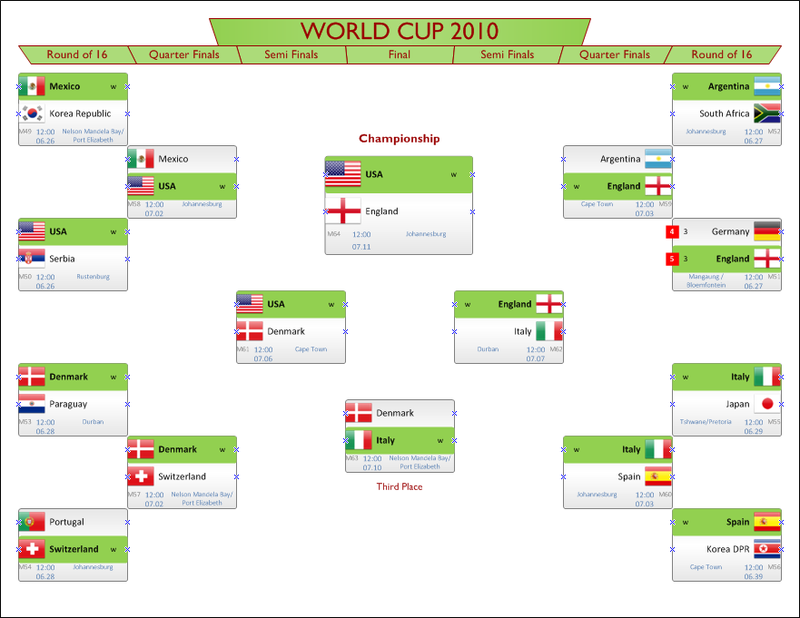 We’ve got a Visio diagram/bracket/elimination chart to help you track progress or document your picks for the office competition! The document is interactive and does what might be called “semi-automatic” diagramming. You have to do some of the work, but Visio helps you out a lot. 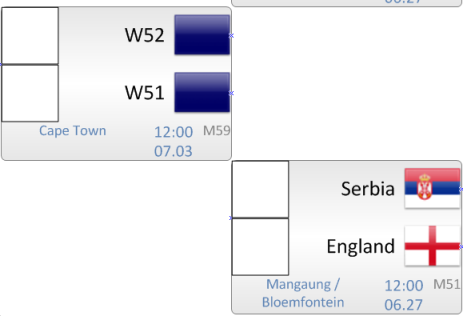 There’s no web-service that automatically updates the scores, but some neat visual cues show up as you enter scores. Be sure to pick a first and second place winner using the two different regions in the menu. And don’t pick the same teams! I didn’t have time to put in logic and checks to prevent this. You don’t have to enter a score for both teams. 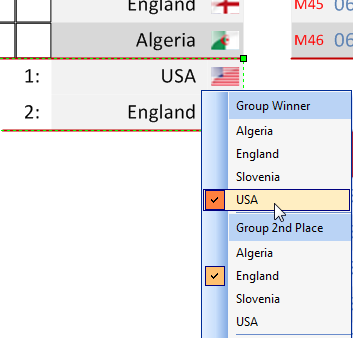 If you are just picking winners, you can type in a “1” in just one of the boxes, or type in “w” for win. Either way, your choice will turn green and move on to the next round, automatically! At the bottom of the first page, there’s also a time zone chooser. Just click the red shape and drag it to your time zone. All of the match times will update accordingly, although the dates don’t change, so make sure you don’t switch on you TV a day early or a day late! 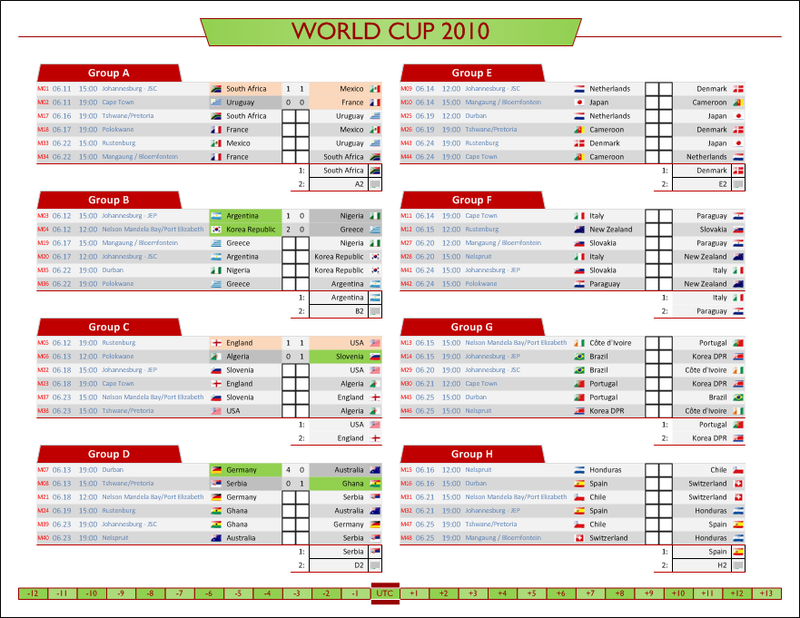 World Cup 2010 Team Flags Visio Multi-shape I used the multi-flag shape in this article to build the World Cup 2010 bracket diagram, by the way! 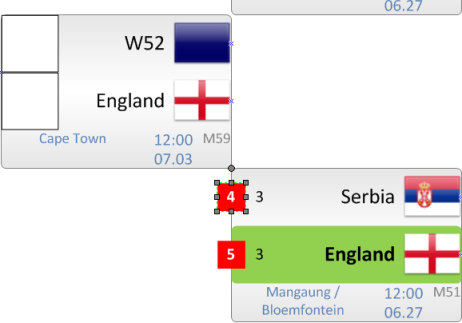 European Cup 2008 Country-Flag Visio Shapes A nice set of country-outlines combined with flags. Not the whole set for this year’s World Cup, but a good start! 8 of this year’s 32 teams are represented in the article. European Cup 2008 Auto-Updating Visio Diagram An interesting bracket experiment from two years ago, plus links to lots of funny soccer videos!